On May 2018, Dr. Kevin Bradley – BSEF Director General – visited Japan, where he had the opportunity to meet with multiple stakeholders and institutions such as METI – The Japanese Ministry for Economy, Trade & Industry. 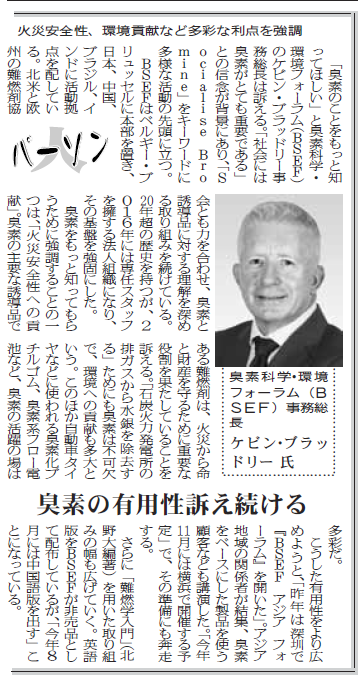 During its visit, Dr. Kevin Bradley was invited by the Japan Chemical Daily to share its views on the role of Bromine in society and economy. The article below was translated from the original version in Japanese, published by Japan Chemical Daily newspaper on 11th of June 2018. Bromine is used in diverse applications ranging from fire safety to mercury emissions reduction and Energy storage technologies. BSEF headquarters are in Brussels, Belgium and they have regional offices in Japan, China, Brazil and India. Founded in 1997, BSEF also cooperates with the Flame Retardant associations in North America and Europe; together they are making efforts to deepen the understanding bromine and its applications.. In 2016, BSEF strengthened their foundation by becoming a corporate organization with their permanent offices and staff. Dr. Bradley points out the contribution of bromine to fire safety and explains that brominated flame-retardants, the major application of bromine, play a significant role to protect our lives and property from fire. The contribution to the environment is also remarkable as bromine contributes to the removal of mercury from coal-fired power plants. In addition to these, there are other bromine applications such as brominated butyl rubber used for automobile tires and bromine-based flow batteries. Last year, in order to promote the multiple bromine-based technologies, BSEF organized the BSEF Asia Forum, a 3-day forum held in Shenzhen, China. The participants from the various regions gathered with experts to exchange best practices. This year the BSEF Asia Forum is scheduled to take place in Yokohama, Japan. In addition to these activities, BSEF has released the English version of the book “Introduction of Flame Retardancy” originally written and edited by Professor Masaru Kitano. The Chinese version will be released this August.